What is a Brony and am I one? For the past 2 years My Little Pony Friendship is Magic (MLP FIM)has made its mark on Flash developed TV shows and on the world wide web. When I came upon it for the first time I was amazed about how much thought and creation when into developing this project. What others have created using MLP FIM as their subject is also amazing. 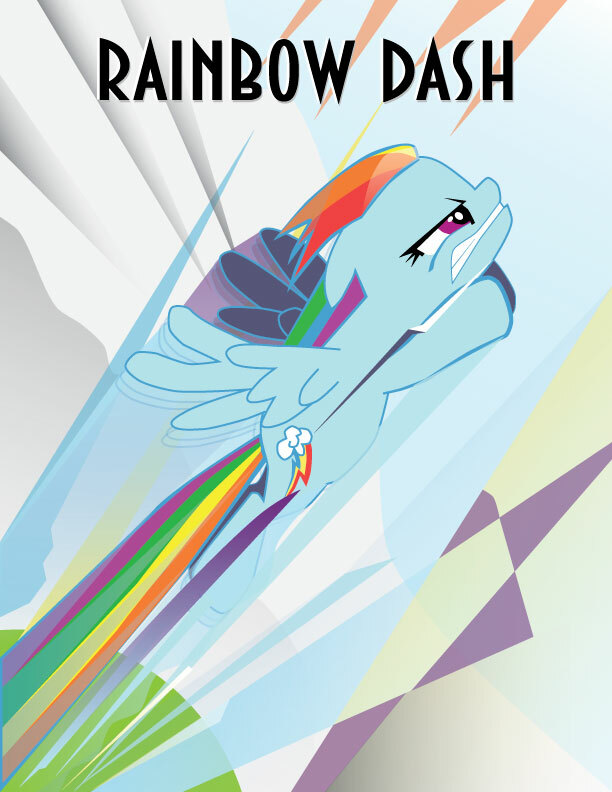 I have done some fan art related to it; My Art Deco Rainbow Dash Poster (https://samohtlion.files.wordpress.com/2011/11/my-little-pony-rainbow-dash.jpg) and Pony Traveling stickers (https://samohtlion.files.wordpress.com/2012/05/fillydelphia-ponyburgh-logos.jpg ). But creating items like this, watching the show, and watching fan edited Pony Vide on You Tube, dose that make me a BRONY? Any who I wanted to share some MLP FIM related videos from the wonderful world of the Internet. Here is a vide good example of how I relate to MLP FIM from a comedy group on The Escapist Magazine website (http://www.escapistmagazine.com/videos/view/loadingreadyrun/5306-Pony-Time ). Here is a neat combinations, this will sound wonderful like Peanut butter and Jelly or horrible like Nazi riding Dinosaurs. MLP FIM music mixed in with the Gorillaz . http://www.youtube.com/watch?v=HS3hvIgTepQ and http://www.youtube.com/watch?v=NDfz9gnR5Ao&list=UU89nrYTIO2ibhrD7p-DGOnA&index=3&feature=plcp Playing these while I am running or drawing is been a guilty pleasure of mine. Plus check out this Pony musician Acoustic Brony (http://www.youtube.com/user/acousticbrony?feature=results_main ). I wanted to end this posting with some creative and out of these world insane MLP videos I found in my Internet travels. Enjoy!!! HEADS UP some of these are dark. But the major question is “ Am I a Brony?’ You know what, dose it matter, not like the world is going to end if I am. Will I ever buy a MLP toy or figure, no. Will I ever do a MLP video. Maybe? But I am going to enjoy MLP FIM in my own way and share in good conversation with other fans of the show.